In March, 2004, the web page with Perseus' Chapter 12 of The Head of the Medusa at Fathers for Life rose to sudden prominence. The popularity of Chapter 12 of The Head of the Medusa did not abate for some months; it actually increased considerably during a stretch of a few months. 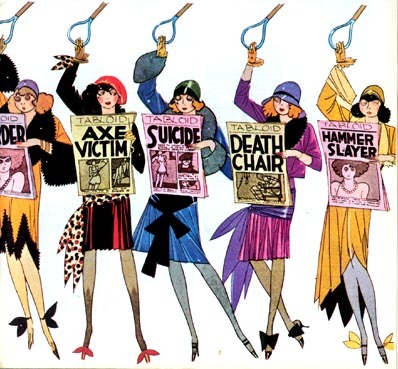 I found that search engine picture-searches for some reason reflected a great interest in the poster with the Flappers shown in Chapter 12 of The Head of the Medusa, and I looked for more information as to why that was. The interest arises out of society's fascination with the non-problem of anorexia nervosa. The Flappers graphic became prominent on anorexia nervosa web pages and blogs. At least one anorexia-nervosa blog uses the Flappers graphic as the background for its home page, which does not justice, I am sorry to report, neither to the graphic nor the text it is the background for at that blog. Large portions of the text on that page are not legible due to lack of contrast between the font colour and the background colour. However, why complain? Chapter 12 of The Head of the Medusa had 206 visitors during the last three full days in that March week. Some people stayed long enough at the page to have read it all, and some went from the page to related pages of The Head of the Medusa. The flappers graphic had been accessed 371 times during the last three full days in that March week. That appears to put anorexia nervosa into the proper light. The "disease" is nothing of the sort. It is a fixation on a surreal fashion ideal. Moreover, since then, interest in the web pages at Fathers for Life that address anorexia nervosa dropped off by about 75%. That more than proves that obsession with anorexia nervosa is not a disease but a compulsion driven by a fashion craze. 4,003 Tune of German folksong, Thoughts are free. The tune, its lyrics (in German, English and French) and the story related to the song are accessible at the bottom of virtually all web pages at Fathers for Life. Symbol of a small student organization that opposed Nazism and whose members got sentenced to death one morning and were executed in the afternoon of the same day. The song "Thoughts are free" has a connection with that. TRUE! cartoon by Daryl Cagle, poking fun at the fact that "Most women value being thin more than being 'successful or well loved.'" Cartoon by SIPRESS: "That's porkthe meat of the pig. It makes an excellent substitute for tofu." Sorry to say, anorexia-addicted readers, although overall the public interest in the web pages of Fathers for Life increased between March and December of 2004, the page hits for the anorexia nervosa pages dropped from 6,809 to 1,767, by 74%. That is not due to a miracle cure. It is most likely due to no other reason than that the vast majority of anorexics apparently became bored with their affliction and went on to other things to obsess with or to do something worth-while. Here are some inconvenient facts, welcomed by anti-feminist activists and mourned by feminists whom young women unabashedly call "dinosaurs". It is a reality that should give pause to ingrained feminists and their camp followers..
During the week of Dec. 3 - 9, 2006, the anorexia-nervosa web page identified here had an all-time maximum number of 42,028 visits. During the past week (Mar. 10 - 16, 2013) the number of visits to that page was down to 46. Is it safe to say that the anorexia-nervosa fad is over? Statistics on absolute numbers of Internet searches that people make for the term "anorexia nervosa" are difficult to find, but Google Trends permits to make comparisons of trends. Let's consider search trends for two terms that show the popularity of the term "anorexia nervosa" in relation to something else that people search for. Let's compare anorexia nervosa, motherhood, and fatherhood. Well, it can be argued that anorexia nervosa no longer interests people very much, so much so that is has lost virtually all public interest. However, if we assume — on the strength of those trend lines — that anorexia nervosa has faded from public view, then fatherhood did so already quite some time ago, and motherhood will be following soon. Which concerns are taking their place? Do you think that feminism can surpass them all in capturing public interest? That was true in 2004, but feminism, too, is fading from view. It is interesting that, over the long term, the rise, and fall from grace (or at least the disappearance from the radar of public interest) of anorexia nervosa closely parallel those of the fad of modern feminism. Have a look. Both are fads, just blinks in the history of civilization, but we have to endure them, pay for them, and we must repair the damages they cause.